Intel's server CPU portfolio just got more diversified and complex with the launch of the Intel Xeon E3-1200 V4 at Computex 2015. It is basically the same chip as the Core i7 "Broadwell" desktop that Ian reviewed yesterday: inside we find four Broadwell cores and a Crystal Well-backed Iris Pro GPU, baked with Intel's state-of-the-art 14 nm process. The Xeon enables ECC RAM support, PCI-passthrough, and VT-D, the former two being features that the desktop chips obviously lack, and VT-D only being present in some desktop chips. 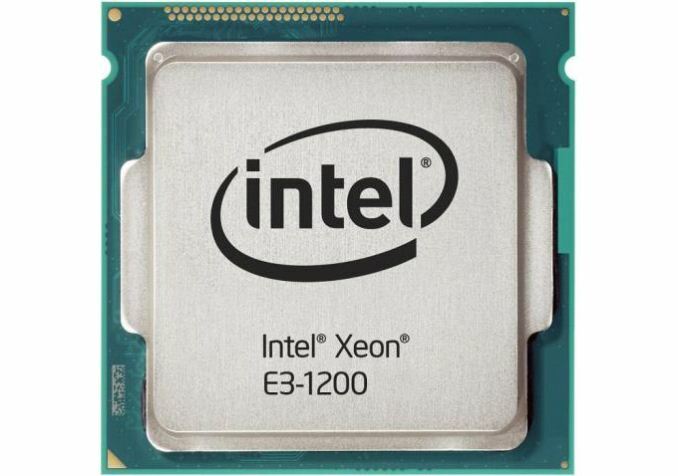 But the current line-up of the Xeon E3-1200 v4 based upon Broadwell is not a simple replacement for the current Xeon E3 1200 v3 "Haswell", which we tested a few months ago. Traditionally, the Xeon E3 was about either workstations or all kinds of low-end servers. It looks like the current Xeon E3-1200 v4 is somewhat a niche product. Besides being a chip for workstations with moderate graphics power, Intel clearly positions the chip as a video transcoding and VDI platform. It looks like - once again - Intel is delivering what AMD promised a long time ago. AMD's Berlin, a quad steamroller with Radeon GPU was supposed to address this market, but the product did not seem to convince the OEMs. Intel claims that the 65W TDP E3-1285L v4 was able to decode 14 1080p (at 30 fps) 20Mbps streams, four or 40% more than on the Xeon E3-1286L v3, which could only sustain 10 video streams. Another use are virtual desktops that use PCI device passthrough to give the virtual machine (VM) full access to the GPU. That way of working is very attractive for an IT manager: it enables centralized management of graphical workstation in a secure datacenter. But it is should be noted that this kind of virtualization technology comes with drawbacks. First of all, there is only one VM that gets access to the GPU: one VM literally owns the GPU (unlike NVIDIA's GRID technology). Secondly you add network latency, something that many graphical designers will not like as adds lag compared to the situation where they are working on a workstation with a beefy OpenGL card. Below you can find the table of the 5 new SKUs. I added a sixth column with the Xeon-D, so you can easily compare. It is pretty clear that the Xeon-D is a much more attractive server chip for most purposes: twice the amount of cores, twice the amount L3-cache, while remaining inside a 45W TDP power envelop. 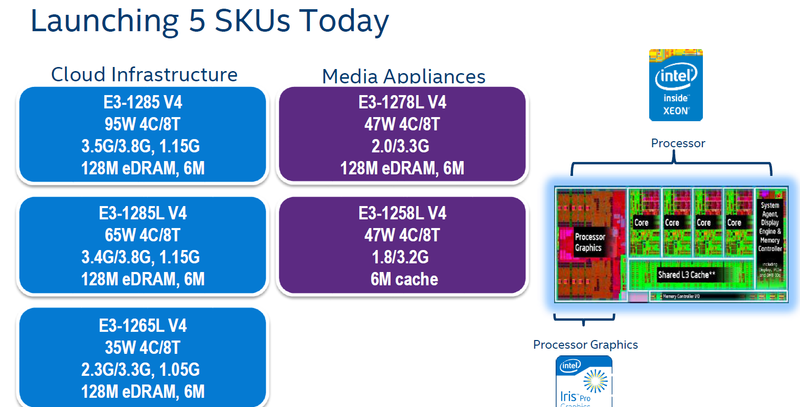 On top of that, the new Xeon E3 v4 still needs a separate C226 chipset and is limited to 32 GB of RAM. The Xeon-D does not need a separate chipset and supports up to 128 GB of DDR-4. In summary, the current Xeon E3-1200 v4 lineup is only interesting if you need a server chip for video transcoding, centralized workstation or a local workstation with relatively modest graphical needs. So you think Intel is knocking nVidia out of the super computer database market in the hopes of being able to buy them up without being shot down?